A rare celestial event dominated the week, while the capture of a rare fish from a faraway place reminded us how the Hudson River is intimately connected to the sea. 9/26 - Newcomb, HRM 302: We had our first frost of the season this morning. It was a bit scattered but enough to make you wish you had covered your plants. It was time to put the garden to bed for the year. Typically this is our peak foliage weekend but the color change seemed to be about a week behind this year. I'm attributing that to this year's exceptionally warm September. But as I have heard said, “Don't worry, the leaves know when to change and they are always right on time.” We have seen lots of Canada and snow geese migrating south over the last two days, some flocks with more than a hundred birds. 9/26 - Town of Wappinger, HRM 67: Today was the last day I found ruby-throated hummingbirds at our feeders. One adult female took a last, long drink and was on her way. Last year the final day came on September 29, the year before, September 25. 9/26 - Beacon, HRM 61: It seemed that only big fish were available today at Long Dock. At least these were the only fish I caught - a welcome development! With the arrival of autumn, I have found the feeding windows widening for both catfish and carp. Three carp, landed and released today, weighed:13 pounds. 4 ounces; 13 pounds 2 ounces; and 8 pounds 4 ounces. The lone channel catfish was 4 pounds 12 ounces, one of those large-headed, thick-bodied males. 9/26 - Furnace Woods, HRM 38.5: Flycatchers, mostly phoebes, had taken the place of the first great flocks of grackles. Tail bobbing, they dipped into every garden. I love to have them in the yard and hate to lose them. Barn swallows left a week ago and the hummingbird feeders stand full, but untapped. 9/27 - Hudson Valley: Tonight’s full moon was this autumn’s Harvest Moon, the full moon nearest the autumnal equinox (9/23). It was also a “Super Moon,” when the moon turns full less than a day from lunar perigee (the moon's closest point to Earth). There was also a total lunar eclipse as the moon passed though the Earth's shadow – three events in one. 9/27 - Newcomb, HRM 302: Like a lot of people, I spent the evening watching the lunar eclipse. For once the event lived up to its hype. Thanks to the skies it was fantastic viewing. I had an incredible wildlife side show as well: geese and songbirds migrating; both screech owl and barred owl were hooting; white-tailed deer were snorting in annoyance that I was interrupting their evening feast under the apple trees; a gray fox trotted through the yard; and finally the coyotes serenaded me and sang to the Harvest Moon. It was an exceptional night. 9/27 - Town of Wappinger, HRM 67: Last night (lunar eclipse minus-one) we had barred owls and coyotes chorusing at the near-full moon. But tonight, with the sky show in full color, there was just a long eerie silence. 9/27 - Tuxedo Park, HRM 36: Today I counted five monarch butterflies enjoying my New England asters. 9/27 - Croton-on-Hudson, HRM 35: I looked out my window and saw that the beautiful full moon had cleared the treetops in a mostly cloudless sky. I went outside with my lounge chair and waited. Small herds of clouds drifted around and across the moon and through the sky. I think the drifting clouds that passed across the moon, darkening the world then floating off to let the moon blaze, were like curtains at a drama. At every opening, the scene had changed, making everything even more dramatic and interesting. When the clouds covered the moon, the rest of the sky darkened and stars came out. I even saw two “shooting stars” when the moon was covered. Each time the clouds drifted away, more of the moon had been eaten by the earth's shadow. The moonlit, then darkened night, was magical and deliciously cool. Crickets sang softly and small things scurried through the garden. I stayed out until the moon was fully red and then, as if prearranged, a heavy bank of clouds arrived and covered everything. It was a marvelous evening. 9/27 - Bedford, HRM 35: It was a consistent, albeit slower, day than previous at the Chestnut Ridge Hawkwatch. A merlin was spotted traveling west and two adult bald eagles were seen together moving north to south directly over the watch. Non-raptor observations included five monarch butterflies. On this date last year, we had counted 6,071 broad-winged hawks. As of today, this season’s number was 6,105. 9/28 - Town of Poughkeepsie, HRM 68: I thought the hummingbirds were gone for the season as we had not seen any for two weeks. But today but we had what was probably a migrant at the feeder and then also at the nicotiana, an ornamental “tobacco” plant, that was still in bloom. 9/28 - Bedford, HRM 35: Foggy conditions caused a delayed start at the Chestnut Ridge Hawkwatch. However, we had decent numbers of sharp-shinned hawks (24), osprey (16), and American kestrel (5) moving in the afternoon. On this date last year, we had counted 678 sharp-shinned hawks. As of today, the season’s number was 617. 9/29 - Town of Wappinger, HRM 67: The dark and gloomy evening sky promised much needed rainfall. Our local pileated woodpecker came zooming past, silhouetting a pterodactyl, calling loudly, before landing on the trunk of a black locust. For the last week the woods had been a night roost for hundreds of mixed blackbirds and tonight their chorus was loud. A monarch fluttered past that might have, in other times, prompted a “count.” But this time there were just four, all passing in twenty minutes, likely searching for a night roost from the coming rain. 9/29 - Bedford, HRM 35: Similar movement as yesterday at the Chestnut Ridge Hawkwatch. 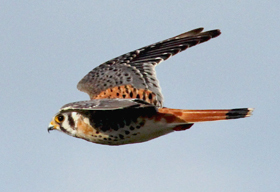 Soon after the start, a male American kestrel flew out in front of the watch, allowing for wonderfully close views. 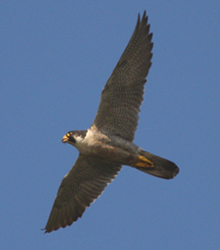 In early afternoon two peregrine falcons moved through, traveling west-southwest. A Cooper’s hawk and a sharp-shinned chased each other on the slope of the eastern hills. 9/30 - New Baltimore, HRM 131.5: The bald eagles around here seemed to have adopted a “new” feeding behavior from the ring-billed gulls. Groups of up to forty gulls follow deep draft barges and ships in search of stunned fish. My guess is that small channel catfish and perhaps river herring may be stunned by the pressure changes caused by the barges and then float to the surface. The gulls can be seen picking up the small fish from the surface. Now with each passing barge, an eagle will glide into the fray following the vessel, apparently attracted to the feeding frenzy in search of an easy meal. 9/30 - Ulster County, HRM 87: We had a terrific day fishing from my kayak on Rondout Creek near High Falls. We caught redbreast and pumpkinseed sunfish, bluegills, largemouth bass and smallmouth bass. One smallmouth was nearly nineteen inches long. I use a five-and-a-half-foot ultra-light spinning outfit so it was quite a trick to keep it away from a log jam and then land it. I have been catching one or two hybrid bluegill-redbreast and pumpkinseed-redbreast sunfish every trip to the Rondout, so the uniqueness of these fish and the big bass biting have made for some very interesting trips. 10/1 - Croton Point, HRM 35: The early morning sky was overcast with drizzle and a cool 50 degrees Fahrenheit as I watched two immature bald eagles on the swimming beach at Croton Point. One of them was feasting on a large fish on the sand. I also counted three American kestrels, a northern harrier, an osprey, and a common raven on the Point. 10/1 - Tappan Zee, HRM 29-28: Strong northwest winds gusting to 25 knots were blowing almost all day as we (DEC Hudson River Fisheries Unit research team) were visiting our sampling sites in the Haverstraw Bay-Tappan Zee reach of the river. Our 21-foot Parker fought the wind-against-tide that was producing five-foot rollers. Our crew got drenched. 10/1 - Inwood Hill Park, HRM 13.5: I spotted a migrating red phalarope (a seagoing shorebird and an Arctic tundra nester) at Muscota Marsh on the shore of Spuyten Duyvil Creek in northern Manhattan. 10/2 - Millbrook, HRM 82: It seemed a bit early for “high-flyers,” flocks of migrating geese, but there they were. Or rather there they seemed to be. In a steady rain from a cloudy sky, the sounds filtered down. Probably not a very large flock, and given the distortion it was unclear to us if they were snow geese or Canada geese. Nonetheless, we recognized the siren song of autumn. 10/2 - Poughkeepsie, HRM 76: I came across my first monarch butterfly caterpillars of the year (three of them, good sized), in a patch of young milkweed. It seemed quite late in the season to be at this stage, as it would still be a little while before they form their chrysalises and then however long it takes to undergo their final metamorphosis. 10/2 - Oscawana, HRM 38.5: As we stood on the Oscawana Bridge at the mouth of Furnace Brook, we spotted a beautiful immature double-crested cormorant perched on a log in the calm waters. It stood still for the most part, occasionally spreading its wings out to drip-dry, even though it was a rainy day with no sunlight. It remained unperturbed as two pairs of mallards swam close by. Eventually the cormorant dove and disappeared beneath the water, and we lost track of it. 10/2 - Croton Point, HRM 34: While we did not catch any today, the DEC Hudson River Fisheries Unit research team has recently captured a few YOY and juvenile crevalle jack at this site. 10/2 - Manhattan, HRM 1: In addition to our usual innumerable YOY oyster toadfish, we caught an adult male blue crab this week, a bit unusual for us, at The River Project’s Pier 40 sampling site in the Hudson River Park. We saw many blue crabs all over our traps, but they kept eluding us by leaping off.